In November 2008, the journalist Raul Weiner of Peru's daily paper "La Primera" ran a story about how 13 members of left-wing organizations were being investigated by police for connections to the Colombian FARC (yep, it's that magic laptop again, the one with zero e-mails and planted photos). We're not talking illegal groups here, but heads of established social bodies such as unions and recognized committees. All were being threatened with custody under the same type of vague anti-terrorism legislation now used in the serious countries as the latent bullyboy threat to anybody that dare criticize governments too much or to loudly. 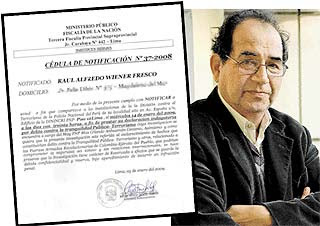 Cut to this week, and Raul Weiner was summoned by Peru's judiciary to defend himself against the very same charges of "crimes against the public peace" and "terrorism", simply because he dared to do his job and tell people what was going on. Weiner was served with the order to attend on Tuesday and his hearing was yesterday, but true to form we do not know and will not know what happened in the courtroom because a gagging order was slapped on proceedings due to "reasons of national security". If this guy is a terrorist, we may as well all go to our local police station right now, form an orderly queue and turn ourselves in. He got wind of a story, he reported on it. The government didn't like the fact that its shady undercover games were made public. The government tries to shut his mouth. That's what's going on here, pure and simple. Yet again, if all this had happened in Venezuela you'd know about it in realtime on fifty-seven channels, Bruce. But as it's happening in Peru and against a left-wing newspaper the only link in English to this story comes from 'Reporters Without Borders', doing its good, non-partisan work as usual.